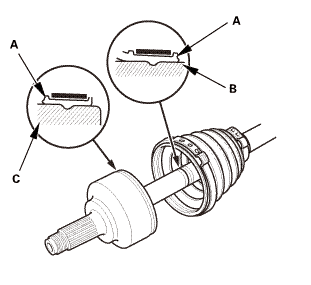 Pry up the stake (A) on the spindle nut (B). 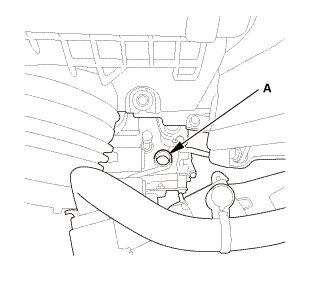 Remove the drain plug (A) and the sealing washer (B), and drain the MTF. Reinstall the drain plug with a new sealing washer. 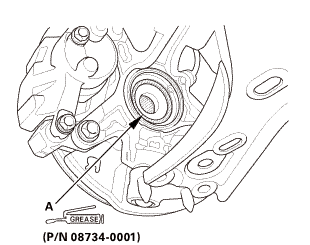 Remove the flange nuts (B). 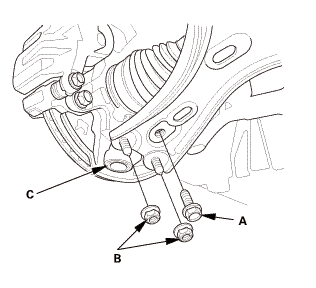 Disconnect the lower ball joint (C) from the lower arm. 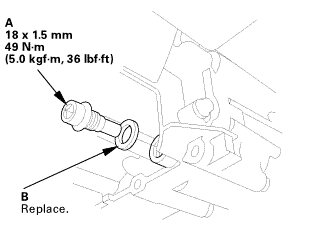 Separate the outboard joint from the front hub using a soft face hammer. 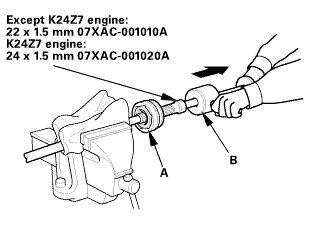 Pull the knuckle outward, and separate the outboard joint from the front hub. 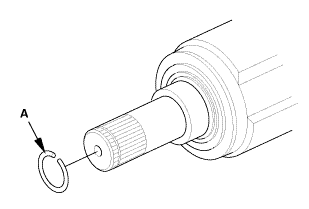 Drive the inboard joint (A) off of the intermediate shaft using a drift punch and a hammer. NOTE: Do not pull on the driveshaft or the inboard joint may come apart. 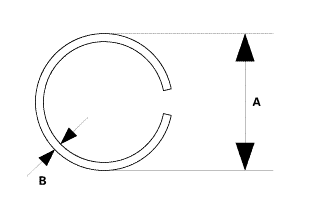 Remove the set ring (A). 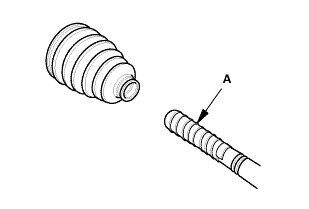 Pry the inboard joint (A) from the differential using a pry bar. 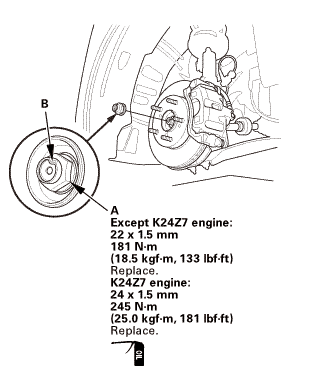 Do not pull on the driveshaft or the inboard joint may come apart. 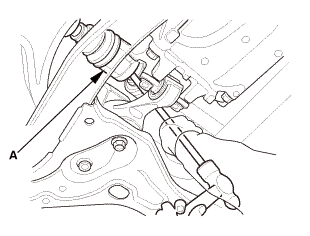 Pull the inboard joint straight out to avoid damaging the oil seal. 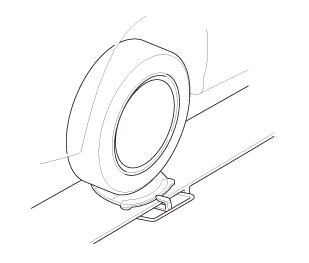 Be careful not to damage the oil seal or the end of the inboard using the pry bar. Lift up the three tabs (A) using a flat-tipped screwdriver. NOTE: Be careful not to damage the boot. Release the ear clamp bands (B). Slide the outboard boot (A) partially toward the inboard joint side. Wipe off the grease to expose the driveshaft and the outboard joint inner race. 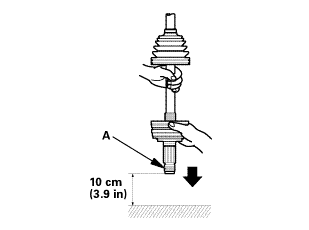 Make a mark (A) on the driveshaft (B) at the same level as the outboard joint end (C). Securely clamp the driveshaft in a bench vise with a shop towel wrapped around the driveshaft. 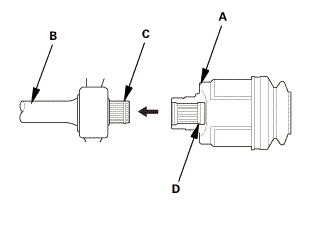 Remove the outboard joint (A) using the threaded adapter and a commercially available 5/8’’-18 UNF slide hammer (B). Remove the driveshaft from the bench vise. 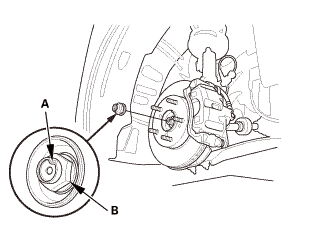 Remove the stop ring (A). Wrap the splines on the driveshaft with vinyl tape (A) to prevent damaging the outboard boot. 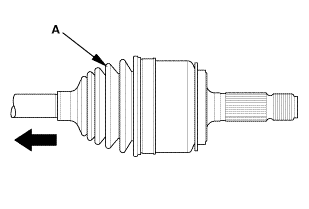 NOTE: Refer to the Exploded View in the Front Driveshaft Disassembly and Reassembly, as needed, during this procedure. Install new ear clamp bands (A) and the outboard boot onto the driveshaft. Make sure to check the size of a new stop ring. 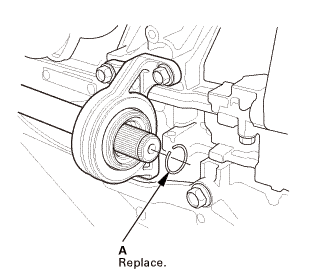 To avoid driveshaft and vehicle damage, make sure you install a new stop ring. 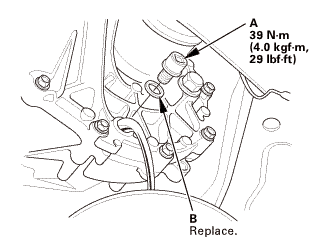 Install the stop ring (A). Pack about 35 g (1.23 oz) of grease included in the new outboard boot set into the driveshaft hole in the outboard joint. 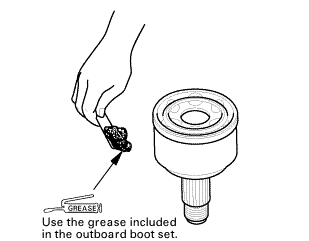 NOTE: If you are installing a new outboard joint, the grease is already installed. 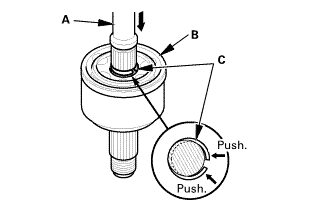 Insert the driveshaft (A) into the outboard joint (B) until the stop ring (C) is close to the joint. 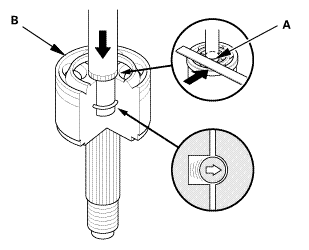 To completely seat the outboard joint, pick up the driveshaft and the joint, and tap or hit the assembly onto a hard surface from a height of about 10 cm (3.9 in). NOTE: Do not use a hammer, as excessive force may damage the driveshaft. Be careful not to damage the threaded section (A) of the outboard joint. 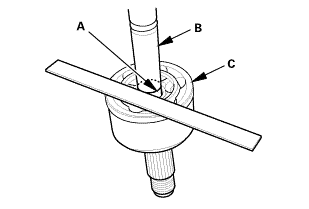 Check the alignment of the paint mark (A) you made with the outboard joint end (B). 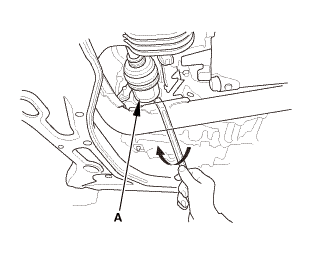 To avoid driveshaft and vehicle damage, the shaft must be all the way into the outboard joint to ensure the stop ring is properly seated. 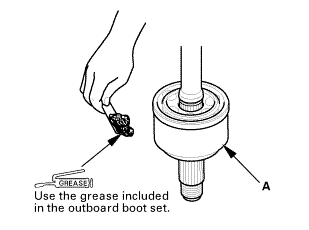 Pack the outboard joint (A) with the remaining joint grease included in the outboard boot set. 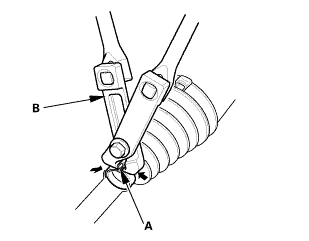 Fit the boot ends (A) onto the driveshaft (B) and the outboard joint (C). 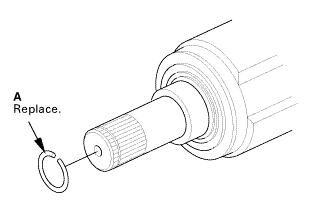 Bleed any excess air from the boot by inserting a flat-tipped screwdriver between the boot and the joint. 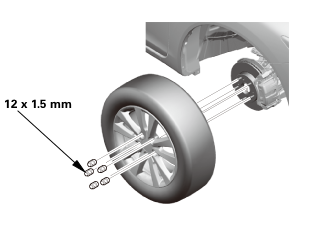 Inspect the length (A) of the driveshafts in the figure as shown, then adjust the boots to halfway between full compression and full extension. Close the ear portion (A) of the band using a commercially available boot band clamp tool (Kent-Moore J-35910 or equivalent) (B). Check the clearance between the closed ear portion of the band. 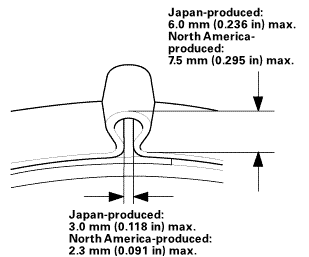 If the clearance is not within the standard, close the ear portion of the band tighter. 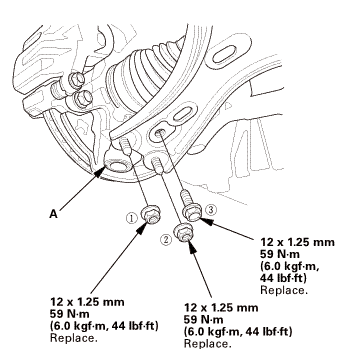 Install a new set ring (A). 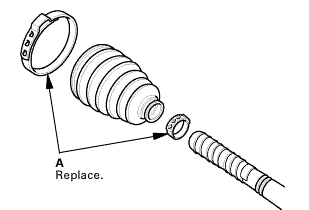 Clean the areas where the driveshaft contacts the differential thoroughly with solvent. 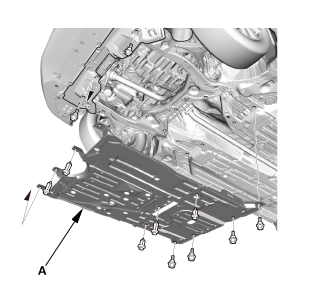 Dry the areas where the driveshaft contacts the differential thoroughly with compressed air. 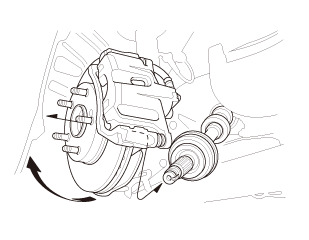 Insert the inboard end (A) of the driveshaft into the differential (B) until the set ring (C) locks in the groove (D). 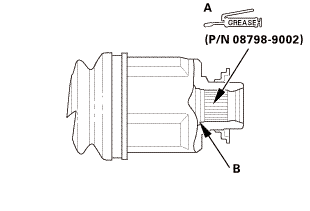 Apply 0.5－1.0 g (0.018－0.035 oz) of super high temp urea grease (P/N 08798-9002) to the whole splined surface (A) of the right driveshaft. 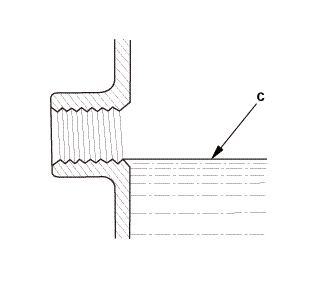 After applying grease, remove the grease from the splined grooves at intervals of 2－3 splines and from the set ring groove (B) so that air can bleed from the intermediate shaft. 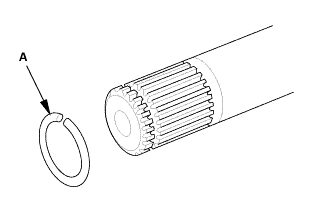 Insert the inboard end (A) of the driveshaft onto the intermediate shaft (B) until the set ring (C) locks in the groove (D). 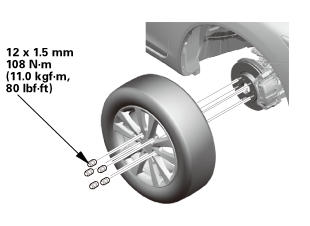 Apply about 5 g (0.18 oz) of moly 60 paste (P/N 08734-0001) to the contact area (A) of the outboard joint and the front wheel bearing. NOTE: The paste helps to prevent noise and vibration. 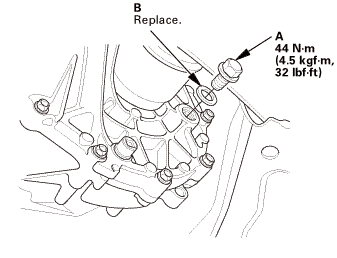 Install the outboard joint (A) into the front hub (B) on the knuckle. 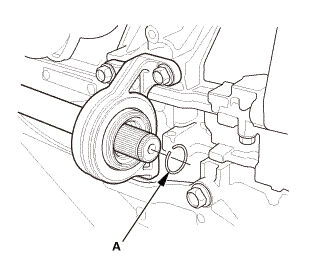 Connect the lower ball joint (A) to the lower arm. Install new flange nuts and a new flange bolt in the sequence shown. 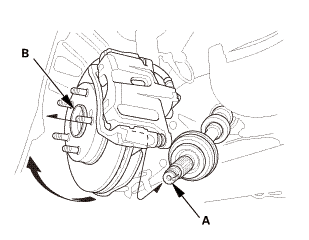 Apply a small amount of engine oil to the seating surface of a new spindle nut (A). 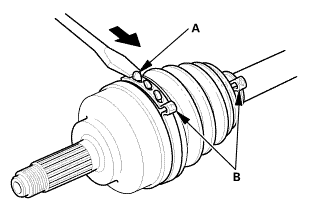 Use a drift to stake the spindle nut shoulder (B) against the driveshaft. 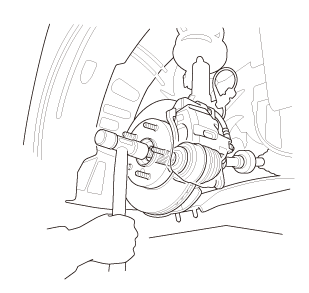 Turn the wheel by hand, and make sure there is no interference between the driveshaft and surrounding parts. 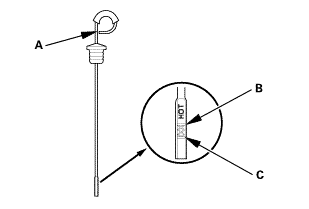 Refill the transmission with the recommended fluid through the dipstick hole (A) to bring the fluid level between the upper mark and the lower mark of the dipstick. 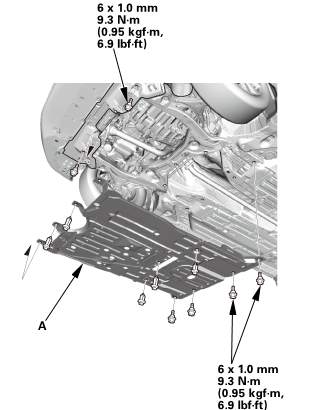 Always use Honda automatic transmission fluid (ATF) ATF DW-1. Using a non-Honda ATF can affect shift quality. 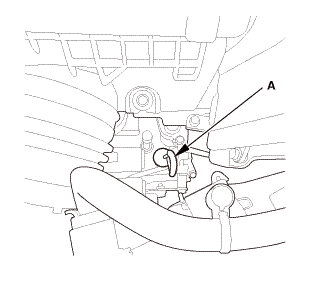 Remove the filler plug (A) and the sealing washer (B). 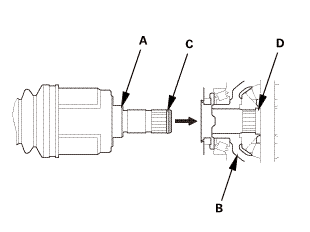 Refill the transmission with MTF to the proper level (C). Always use Honda Manual Transmission Fluid (MTF). Reinstall the filler plug with a new sealing washer.